Within a subgroup of patients their bodies have a higher inflammatory reaction to titanium implants. This increased inflammatory response can lead to tissue destruction, bone loss, and loss of the implant. A titanium stimulation test detects your cytokine response to exposure of titanium oxide. In some individuals they react to titanium implants differently than the average patient. They have different genes that increase their bodies response to the titanium implants. This can lead to tissue inflammation, bone loss and implant failure. Genetic tests can show the degree of inflammation of the body to titanium oxide. Before you decide to get a titanium dental implant, you may want to have a “Titanium Stimulation Test” and a “Genetic Predisposition To Titanium Test“. If you have a positive titanium stimulation test and a high degree of inflammation response to titanium oxide, you can have a 12-times higher risk of titanium associated inflammation/loss of the implant result. These positive results should not be confused with titanium allergy or even an absolute contraindication for titanium implants. 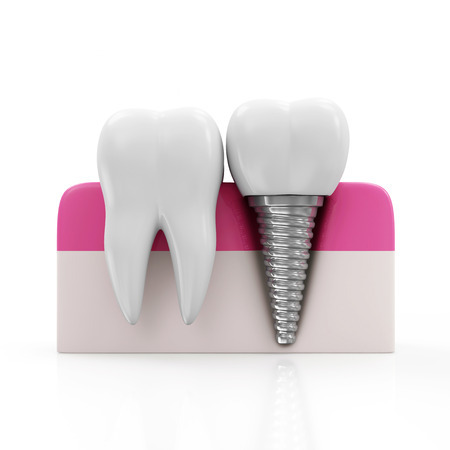 However, there are alternatives to a titanium implant and they could be considered before treatment in your case. Zirconium implants, Conventional bridges, First-Fit (smaller) bridges, resin-retained bridges, cantilevered bridges and other alternatives have been used for many patients in the past and could be a better choice for you. Ask your dentist about all the alternatives advantages and disadvantages and be comfortable with your informed consent before following through with your treatment plan. “Titanium Intolerance“, IMD Labor Berlin-Potsdam, www.imd-berlin.de, 2017.